[ Poll ] India based airlines are up a creek without a paddle! [ Poll ] Aviation Boom - 2.0? [ Poll ] Airlines that have the best fleet and seat planning. [ Poll ] Favourite Economy Seating Configurationon on a Widebody? London - Kolkata, why nothing direct? 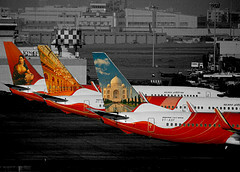 [ Poll ] The 787 - What should Air India do? [ Poll ] Your Favorite Transit Hub! [ Poll ] Jetway or Ramp? [ Poll ] Favourite South-East Asian Airline? [ Poll ] Things to remember when your plane is hijacked!!! [ Poll ] How about S.A.S.I. alliance? [ Poll ] Favourite IFE? BA or AA - which do I prefer? [ Poll ] Favourite Gulf Airline? [ Poll ] Which location can we have the meet?